Publisher: London & Derby, 1893 - 1894. By H. Arnold-Bemrose, M.A., F.G.S. PERSONS who have travelled in the district between Ambergate and Matlock are familiar with Crich Stand. It is a tower on the top of a limestone hill, in the western face of which is a quarry containing large blocks of rock piled confusedly one upon another. The walk from Ambergate or Whatstandwell is enjoyed by all who are fond of the country, and the tower, from which often a splendid view can be obtained, is much visited by excursionists. The enjoyment is much greater if the traveller has some knowledge of the way in which the rocks were formed and the surface of the country attained its present shape. 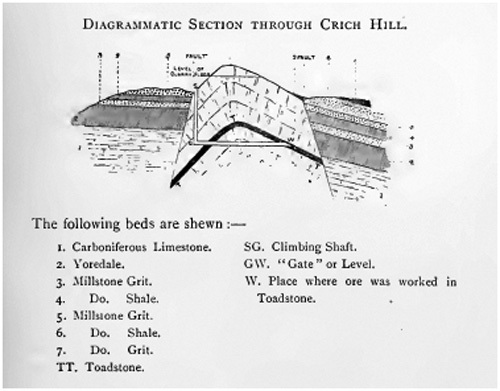 The following notes are intended as a slight sketch of the internal structure of Crich Hill, and to give a description of the occurrence of lead ore in the toadstone. The district is interesting because of several landslips which have occurred, and even now yawning clefts, due to the last slip, may be seen from the tower. The hill is composed of massive beds of mountain limestone containing fossils, and is entirely surrounded by beds higher up in the series. If we visit the quarry in the cliff, we see that the beds are not horizontal, but that the bedding planes are curved. As we look at a section from north to south, or at one from east to west, we notice the bending of the strata. The dip is what is called a quaquaversal, that is, the beds have been bent so as to dip in all directions from a centre, the bending having been greater in some directions than in others. This has been done by lateral pressure. On the west side of the hill the higher beds have been sunk, and the millstone grit and Yoredale shales denuded from the top of what was once a higher hill, leaving the surface of the limestone bare; so that we have the limestone hill on which Crich village is situated, like an island mountain of limestone rising up from under the sea of newer rocks around it. It is generally said that the last landslip was caused by the limestone sliding over a bed of clay. This bed is exposed in the quarry, and if examined carefully, it is found to be not a bed of clay, but one of black shale containing fossils. The upper and lower portions of the shale bed are decomposed to a sort of clay. The shale contains numerous crystals of pyrites (sulphate of iron). This mineral easily decomposes into tiny crystals of selenite (sulphate of lime), which are found in the more altered portions of the shale. There are many old shafts in this hill leading to several old lead mines. In one mine heap I found several pieces of a rock called toadstone, which had been brought up from the mine at a depth greater than that of the floor of the quarry, none of this rock being seen in the quarry. It has been a matter of dispute whether lead ore has been found in the toadstone; some have maintained that it has, and others have denied it, pointing to its name as having been derived from the German Todtstein, meaning deadstone, because ore was not found in it. When I heard, therefore, that the lead ore was being worked in the toadstone inside Crich Hill, I was anxious to go down the Wakebridge mine, and satisfy myself of the correctness of the statement. In the Wakebridge mine, the men work in shifts of six hours each, changing at noon, midnight, six a.m., and six p.m., so that when I arrived a little before one o'clock on a Saturday afternoon, the miners had left work for the week. 46 NOTES ON CRICH HILL. "Coestead." In the centre of the building was a stove with a good fire, on the wall were hung the miners' working clothes. My guide changed his dress, whilst I put on over my clothes a loose pair of trousers and a coat belonging to one of the men. We took a supply of candles and matches, and my hammer and bag for specimens. The engine shaft, about 600 feet deep, is used for bringing up ore, but not for conveying persons. The entrance to the climbing shaft is through a door near the outside of the " Coe." The descent of about 420 feet is made by means of ladders, which are almost vertical, and are fastened to the side of the shaft. At the foot of some of the ladders is a small landing stage of wood. In climbing, the candles are placed in a lump of clay for candle-sticks, and held between the thumb and forefinger of the left hand, whilst the iron rungs of the ladder are grasped with the three remaining fingers of the left hand and with the right hand The descent is moderately easy when the ladders slope sufficiently, but rather difficult when they are vertical, and too close to the sides of the shaft for much toe room. 200 yards, and then N-E. I have said that the strata in Crich Hill form a sort of elliptical dome. Perhaps the best way to obtain a mental picture of the beds, is to imagine a series of pie dishes without rims, fitting into one another like a nest of Japanese boxes. The whole series is inverted, forming a dome, in which the different dishes represent different beds of rock. In making a horizontal tunnel through the series of dishes we should pass through successive dishes, from the outer one to the innermost one, and having reached the centre pass through the opposite sides of the same dishes, but in the reverse order. This illustrates the way in which we passed through successive beds of rock in Crich Hill, proceeding through outer or upper beds to inner or lower ones, and then through some of the lower ones again, until we reached the toadstone at the opposite side. GW. "Gate " or Level. W. Place where ore was worked in Toadstone. 48 NOTES ON CRICH HILL. four inches thick. It is coloured red with oxide of iron, and contains small crystals of selenite. In several places, the gate traverses faulty rock, which has to be kept up by building an arch or roof of stone or timber. About four yards of faulty rock obscures the junction between the limestone and the toadstone below it. The word toadstone is a very vague one as used by miners. It occurs black or dark green when fresh, with larger or smaller crystals glistening in it. At the top or bottom of a bed it is often vesicular, i.e., contains steam holes like those in slag, or in pumice stone, due to the escape of gas when the rock flowed in a molten stream as lava. These holes are often filled with carbonate of lime, by the infiltration of water, and the rock is then said to be amygdaloidal. Under the action of air and water, toadstone becomes decomposed, and altered to a greenish-coloured rock, and even to a sort of clay, so that miners have sometimes taken a bed of clay to be altered toadstone. decomposed, and of a green colour. Here is the place where they were then working. The ore occurs in a lode, i.e., a rent or fissure, vertical, or nearly vertical. This fissure has been filled with vein stuff, consisting mainly of calc and fluor spar, and galena, or lead ore. The gate or level along which we had come followed the course of the vein for a greater part of the way. The method of working is to remove the vein stuff from the roof of the gate, thus increasing the height of the roof. A stempel, or thick wooden bar, is placed across the gate from one wall to the other, at a height of about a yard from the ground. This forms a step, on which a man can stand and still further increase the height of the roof by removing more ore and other material, Another stempel is fixed about a yard above the first one, and a little to the front, and so the men work upwards into the lode, leaving behind them a fissure, with wooden stempels placed across from one wall to the other. Climbing by stempels for the first time produces an uncomfortable feeling, and the higher one gets, the more important becomes the question how to get back again. I think, however, that the descent is easier than the ascent. We ascended about twenty yards in this way, and came to the vein of lead ore. On the way up I saw amygdaloidal toadstone in an advanced stage of decomposition. The rock at the sides of the vein is hard, and sparks are produced when it is struck with the hammer, probably due to the pyrites contained in it. The miners called the rock toadstone; to me, however, it seemed to be a compound of calcareous material and pyrites. Standing on a platform composed of a few planks placed across stempels, I detached a good specimen of lead ore in large cubes, and obtained some of the rock in which the vein occurs. We then descended to the tram line, and made the return journey, having been underground for four hours and a half. 50 NOTES ON CRICH HILL. though the shapes of the olivine and felspar crystals remain. In addition, the rock contains a quantity of pyrites, scattered throughout the mass. I had small pieces of this rock from different parts of the bed cut, ground, and polished until they became so thin as to be transparent. When these are placed under the microscope, the minute structure of the rock is seen. The following is a very brief description of the specimens thus examined. (1) Toadstone in- which the ore occurs. The felspars appear in the section like laths or matches. They are much altered. The black material is pyrites, and is not an original constituent. The rock, technically speaking, is a decomposed olivine-dolerite. (2) Upper part of toadstone bed, called Blackstone by miners, within a few yards of the limestone above it. An altered olivine- dolerite, now consisting of felspars, all altered to calcite and serpentine, olivine altered to the same materials, small rods of magnetite or ilmenite, the whole traversed by veins of calcite and haematite. (3) Lower down, "Blackstone." Less altered than No. 1. The felspars are fresher. The olivine is altered to calcite. Much calcite occurs throughout the mass, and probably replaces augite. (4) Near the bottom of bed, called toadstone by the miners, a light-grey hard rock, of similar structure to No. 1. Much more altered than Nos, 2 and 3. The rock in the interior of the bed is, therefore, less altered than that near the top and bottom. (5) From mine heap near the top of the hill is less altered than any of the preceding. The felspars are nearly fresh, the olivine is altered to calcite; a little fresh augite occurs, magnetite is also present. This toadstone was, no doubt, once a lava stream. There are several beds of this rock in Derbyshire, and I hope in a future volume of the journal to describe some of them, and point out the evidence we have of former volcanic action in our county. It is about two years since I paid my visit to the Wakebridge mine. Last summer, the workings in the toadstone were closed because the miners were getting near the top of the bed, and were afraid of water making its way into the mine if they proceeded further. I am told that the ore in the toadstone was as good as that in the adjacent limestone. Other occurrences of ore in toadstone have been noted, but I am not aware that any microscopical examination has been made of the rock supposed to be toadstone. As I have stated above, the rock in which the ore was found looked very much like an altered limestone, and a microscopical analysis was necessary in order to determine that it was toadstone. I must here express my thanks to Mr. Spencer and his son for their kindness in giving me information and the opportunity of visiting the mine. The common popular belief is that Crich Hill owes its present shape to some violent "convulsions of nature," thus "explaining the unknown by the still more unknown." Whereas science, proceeding from the known to the unknown, leads us to the opinion that the agencies which we now see at work around us are the same that have been operating during the ages long gone by. The occurrence of an igneous rock in the interior of the hill might seem to corroborate the popular opinion, but this bed of toadstone is not intrusive. * It lies between two beds of limestone, and is bent with them. This is shown by the fact that the horizontal workings pass through the toadstone to the beds of limestone underneath it, and then again into the same bed of toadstone. The latter, therefore, must have flowed as a lava stream over a bed of limestone, and was, in its turn, covered by a deposit of limestone. The whole series of beds were afterwards bent into their present form. * Reasons for this belief will be given in a future volume.